The Mecum Auctions Anaheim 2013 sale was held November 21-23 at the Anaheim Convention Center in California, resulting in nearly $14 million in total sales and a 50.7% sell-through rate. 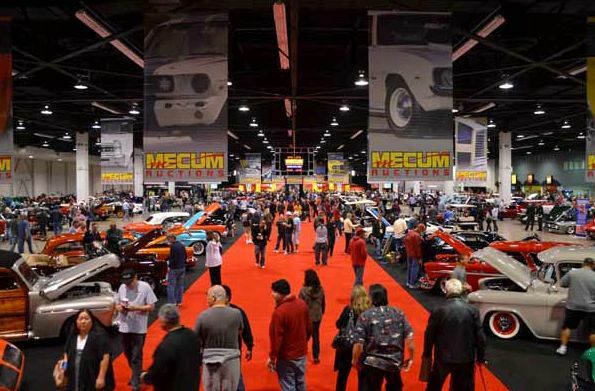 Mecum originally anticipated a 750-car lineup for the 2013 Anaheim auction, but the final run total saw 812 vehicles crossing the block. A total of 412 hammered sold with deals continuing to be made in the ‘Bid Goes On’ department. Top sales were a reflection of the variety of cars offered with everything from modern-day supercars and classic muscle, to ‘50s era cars and customs making the list. Two Ford GTs (Lot S114.1 and S196.1) took the top honors at the 2nd annual Mecum Anaheim sale with a 2006 and a 2005 both hammering at $210,000. A highly optioned and well-documented 1969 COPO Camaro (Lot S123) was next in line selling for $180,000. Steve McQueen’s Harley-Davidson (Lot S138.1) also made the top 10 list coming in at number nine with a $125,000 gavel price. Further notable sales included a 1931 Ford Model A custom pickup nicknamed “The Grasshopper” that sold for $100,000. For complete results, visit www.mecum.com. Mecum’s next collector car auction will serve as the grand finale of 2013 and will be held in Kansas City, Missouri on December 5-7. For more information or to consign a car for an upcoming Mecum auction, visit www.mecum.com or call (262) 275-5050.